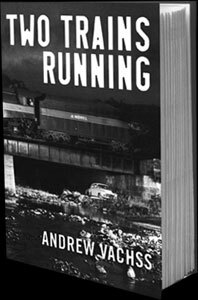 You can't yet read Andrew Vachss' latest, Two Trains Running, but you can have it read to you! Random House Audio has provided us with an excerpt from the audiobook release of Two Trains Running, as performed by David Joe Wirth. David Joe Wirth can be heard reprising his stage performance of "Placebo" on the audiobook Proving It, a collection of Andrew Vachss' short stories, and in the audio presentation of Replay, a play by Andrew Vachss. Mr. Wirth has performed at numerous theatres in both New York City and Chicago, working with such notable writers and directors as David Mamet, Robert Falls, and Stuart Ross. He lives and works in New York City and has been closely involved with Mr. Vachss' work throughout the past decade. A candy-apple-red '55 Chevy glided down the rain-slicked asphalt, an iridescent raft shooting blacktopped rapids. Behind the wheel was a man in his mid-twenties, with a wiry build and a narrow, triangular face. His elaborately sculptured haircut was flat on top, long on the sides and back, ending in carefully cultivated ducktails. The Chevy's headlights picked up an enormous black boulder, standing sentry in a grove of white birch. The driver pumped the brake pedal, then blipped the throttle as he flicked the gearshift into low. He gunned the engine, kicking out the rear end in a controlled slide through a tight S-curve. As soon as the road straightened, he eased off the gas and motored along sedately. A quarter-mile later, the driver pulled up to what looked like a miniature cottage. A lantern-jawed man slowly rose from his seat on the one-man porch. He held a double-barreled shotgun in his right hand like an accountant holding a pencil. "It's me, Seth," the driver said, out his side window. "I knew that a few minutes ago, Harley," the man with the shotgun replied. "Heard those damn glasspacks of yours a mile away." "Come on, Seth. I backed off as soon as I made the turn," the driver said. "You're getting way too old for that kid stuff," the man said reproachfully. He stepped closer to the Chevy. The driver reached up and flicked on the overhead light. The man with the shotgun glanced into the back seat, then shifted his stance slightly to scan the floor. "Let's have a look out back," he said. "What'd he look like?" Rufus asked Silk. The two men were in the back booth of a sawdust-floored juke joint, walled off from the other patrons by three men who stood in a fan around them, facing out. "Like any of your regular hillbillies, man. Kind of tall, but not no giant. Slender, but not skinny. White skin, but not ex-con color. He just … average-looking, I guess. Not the kind of man leaves an impression. Except for his eyes." "I couldn't even tell you, brother. Not in the light we was in. But it's not the color, it's the look." "That's it! Even when he smiled—"
"And he gave you those?" Rufus asked Silk, looking down at the pimp's open palm. "Just gave them to you?" "Looks like a pair of gold dice. With little diamonds where there's supposed to be dots." "Solid gold, brother. Real diamonds. You never heard of these?" "You know how old Capone was when he went to prison?" "Just a little past thirty," Mack told him. "And when he was released, he was barely forty. So how come he didn't move right back in, take over the rackets again?" "He was sick, I thought." "He was sick all right, kid. Paresis, you know what that is?" "No. His brain was all rotted out. From syphilis." "I'm not accusing you of being prejudiced, Davy. But that is what you heard, isn't it? That only coloreds get it?" "And gave you the short-arm inspection when you got back from leave, sure. But that's for the clap, gonorrhea. Syphilis, it's what the colored people call 'bad blood.' Compared to the clap, it's like a howitzer against a rifle." "How come you know so much about this?" © 2005-2009 Andrew Vachss. All rights reserved.